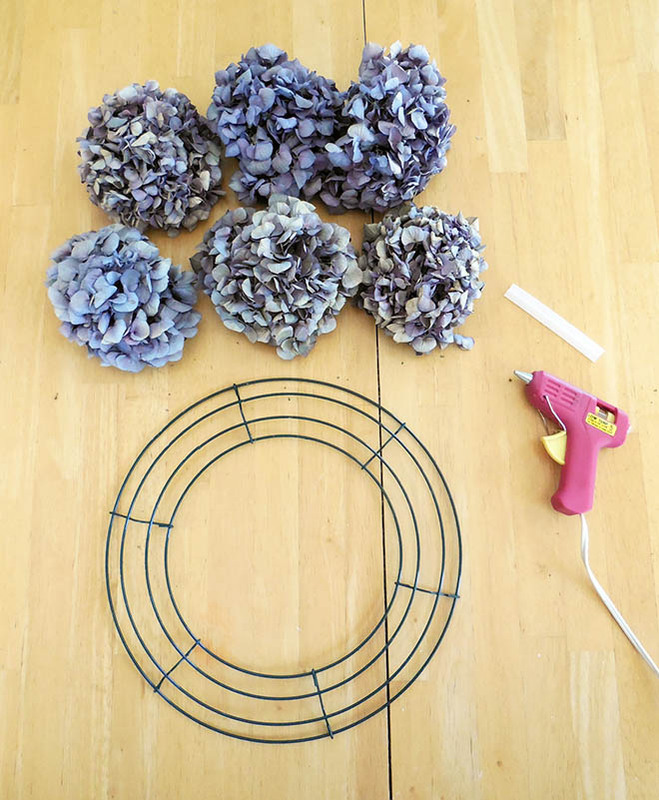 All you need is are some dried hydrangea, a 12′ wire wreath frame (where to buy), a hot glue gun, and glue sticks. Before we jump into it, I want to tell you that I am not an expert on drying flowers in any way, shape, or form. The way I dry my hydrangea flowers is to harvest them and set them on the floor of our shower in our guest bathroom for a few weeks until they are completely dry. There are several different ways to dry them, as well as flower preserver spray to make them last longer. I just prefer to keep it simple and just dry them out naturally like they did it back in the day. 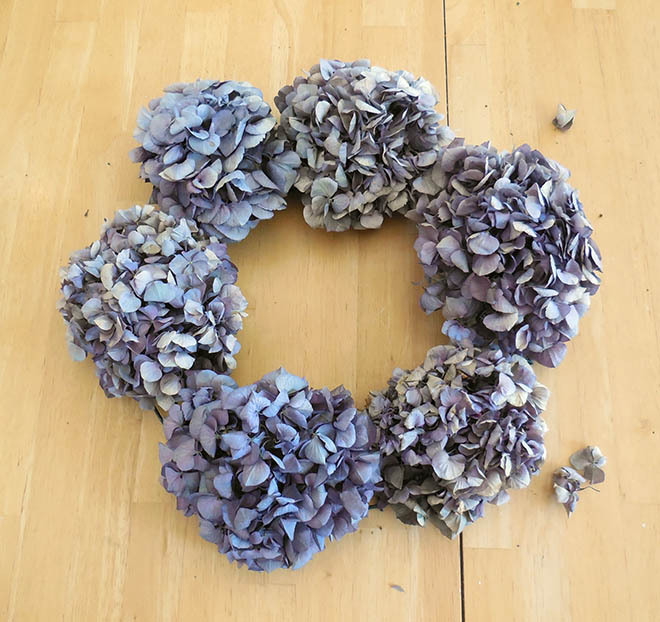 Lay out the hydrangea flower “clumps” loosely on the wreath base. You don’t want to smush them too tightly together at this point because they will start losing flowers. This is just give you an idea of how the finished wreath will look before you do any gluing. … and gently but firmly press a flower clump onto the glue. 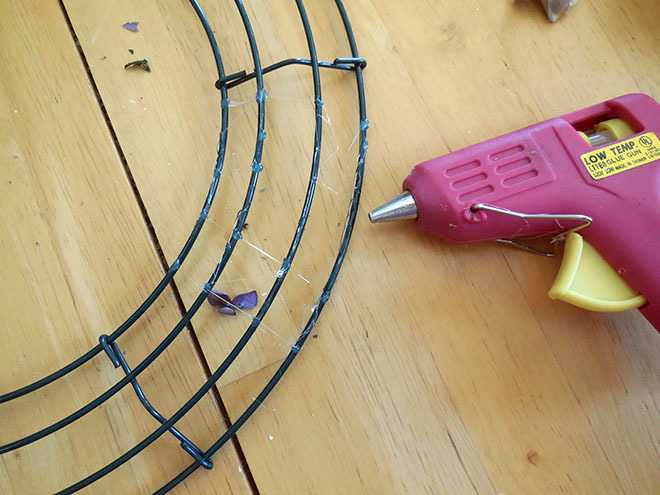 You want to do this whole process quickly because the hot glue dries fast. 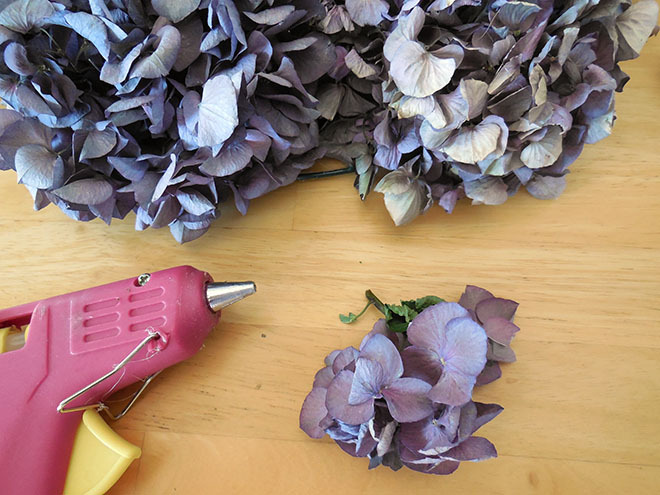 If you wait too long, the glue will dry and won’t stick to the flowers. 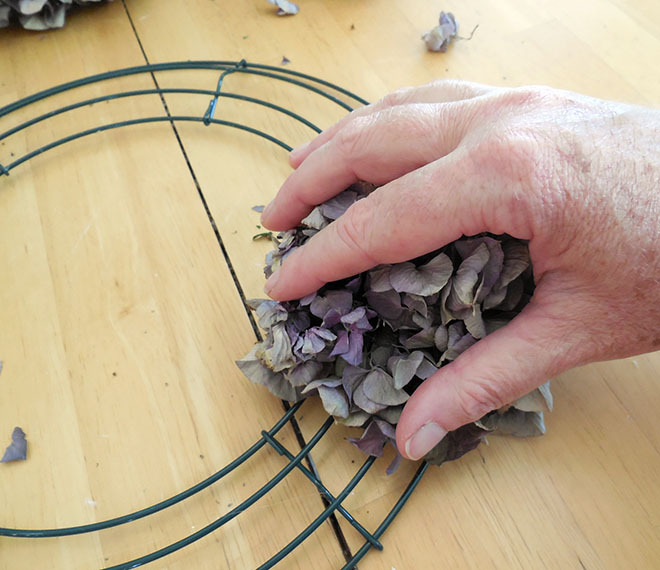 Repeat the process, pressing the flower clumps gently but firmly together as you work around the wreath frame. You will lose some flowers off the clumps no matter how gentle you are. So if you do lose some flowers, don’t worry – this is normal. 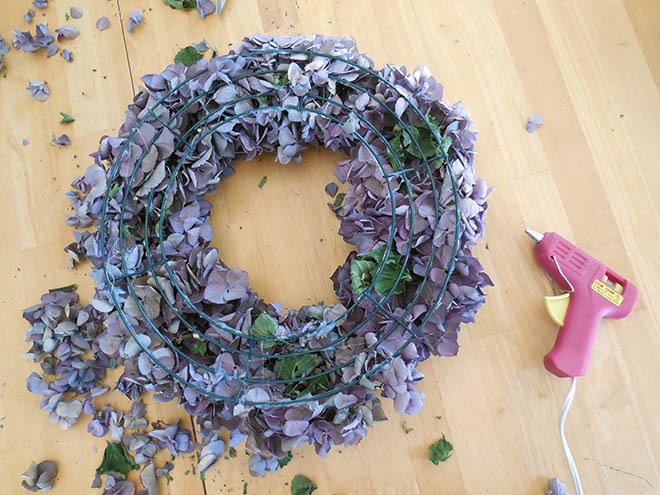 If you have any gaps in the wreath, glue in small flower clumps to fill them in. Turn the wreath over and gently place it wrong side up on the table. Glue any spots where the flowers are not glued to the wreath frame. Leave a small area open on the outermost ring of the wire frame to string burlap or twine for hanging. That’s all there is to it! 🙂 Hang up your wreath and enjoy! I really like how mine turned out! It’s the perfect finishing touch above the fireplace in our master bedroom! 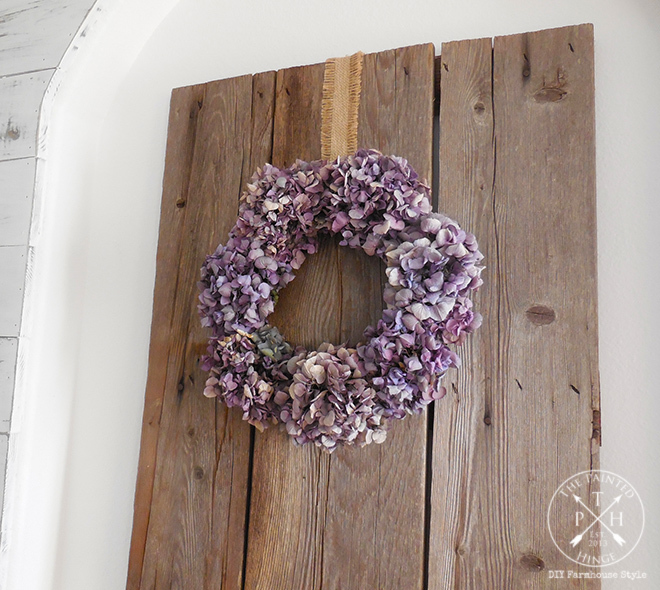 I hope you enjoyed this tutorial on how to make a dried hydrangea flower wreath! 🙂 If you have any questions or comments, please leave them in the comment section below! Oh so beautiful. I made one years ago. And I have planted hydrangeas at my current house, but I don’t have enough blooms yet for a wreath. But I love yours! Thanks so much Jess! 🙂 And thank you for hosting! I love hydrangeas! Unfortunately they don’t grow here in Arizona. It’s super pretty and looks great against the wood. Visiting from Grandma’s House party. Thank you Mary Beth! 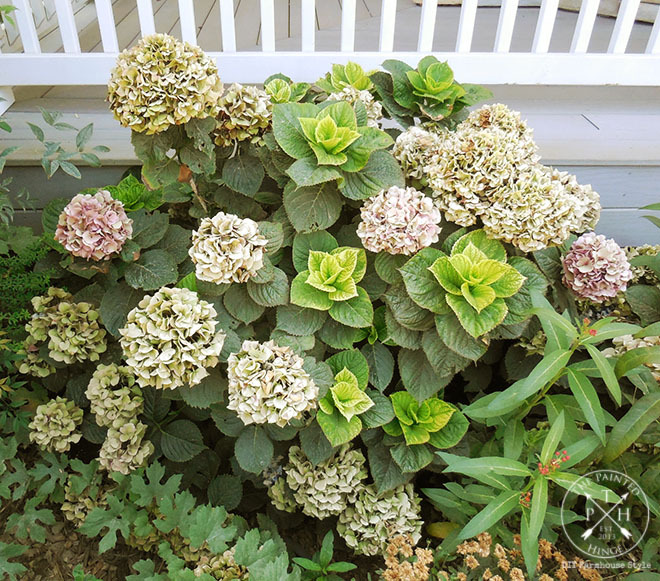 🙂 I’m sorry you don’t have any hydrangeas 🙁 If you can grow them in your area, you should consider getting some – they are super easy to take care of! Absolutely gorgeous! Thanks for sharing @ Vintage Charm–pinned! 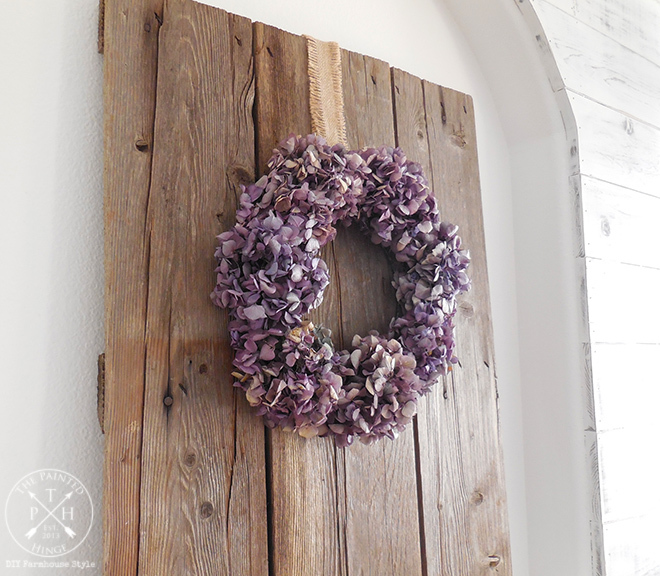 I love the simplistic beauty of this wreath! I don’t have any hydrangea bushes, but surely I can find someone that does and will share their flowers. I would like to make this one! Thank you for sharing it at Party in Your PJs. Pinned and shared! I am a huge hydrangea nut and I LOVE your wreath! I think we have over 30 hydrangea bushes at this point (my husband puts up with my craziness and keeps buying me more). We have pinks, whites, greens, blues and somewhere in between! I display them all year round in every room in the house! 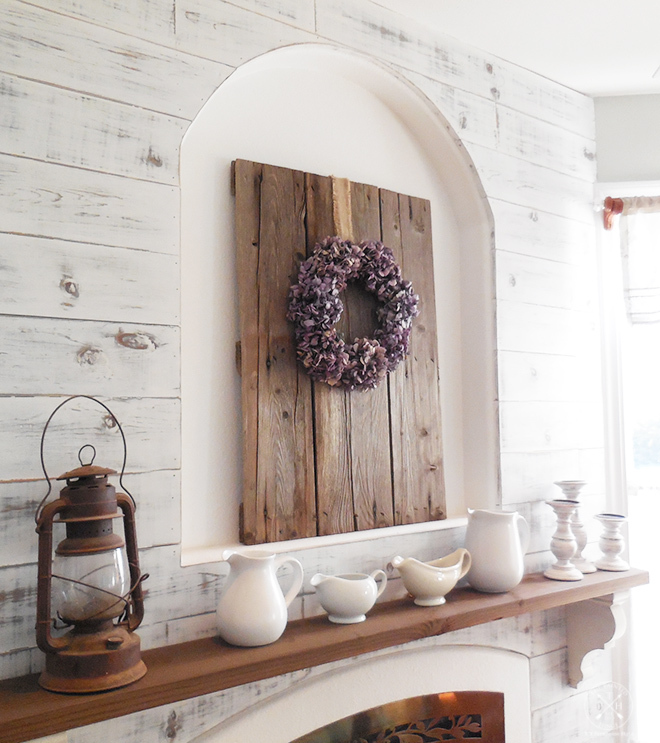 I also love your rustic fireplace gorgeous and the perfect place for that wreath! Wow! That is just gorgeous! I’m coming over from the Vintage Charm party…congrats on being featured! I’m so excited hydrangeas will grow at our farm- I couldn’t grow them at the city house. I can’t wait to have enough blooms to make a wreath! wow! I love this! 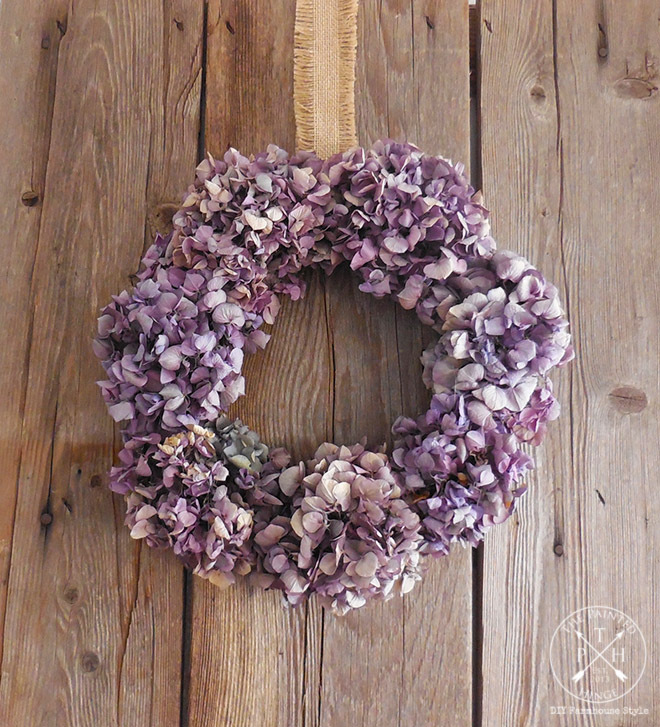 I saw your feature from the vintage charm party and this wreath is gorgeous. I can’t believe that they dry so well. I will definitely be pinning. I can’t wait to get my hands on some hydrangeas now! One year I let my hydrangeas dry on the bush and went out and spray painted them gold and copper, then picked them. If my sister-in-law looked out the window, I’m sure she would have had the men in the little white coats come and get me with a net. BUT it worked. Made great wreathes! Loved your purple–my favorite color. Coming over from Vintage Charm … Congratulation on being featured. Well deserved. Love your wreath. Would love the dried ones, but will just have to settle for the silk ones.